Stream hydrology, the daily and seasonal pattern of a stream's discharge, is one of the most managed compo nents, although some features, such as extreme floods and drought, are difficult or impossible to control. Hydrology is also one of the most important components to ecologi cal self organization and stability. 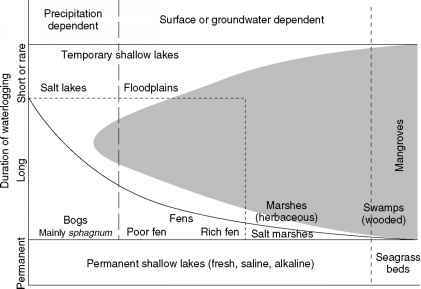 Hydrology shapes the physical habitat within a channel by creating pools, riffles, and meanders, regulating substrata size and sediment load, and establishing a relatively stable downward slope across the landscape. Natural stream discharge, which shapes biotic communities through seasonal floods and droughts, has spatial and temporal variations in channel velocity, material transport, and headwater-downstream linkages of energy flow. Alterations to the physical char acteristics of the channel, or to the amount or timing of the discharge, can affect the natural variability, and in turn the biotic communities that have adapted to it. Changes in hydrology can be caused by channelization, dams, and/or watershed alteration from urbanization, deforestation, or agricultural development. The removal ofnative vegetation within the watershed or in key riparian areas and the construction of impervious surfaces strongly influence seasonal and daily discharge and increase the intensity and frequency of flooding. During storm events, reduction in precipitation infiltration, vegetation inter ception, and evapotranspiration increases overland flow (runoff) causing water to enter the stream quicker and in a larger pulse. On the other side of the spectrum, water withdrawal and dam construction can also cause major changes in natural discharge. Surface water and ground water extraction for irrigation, domestic, and industrial use can lead to significantly reduced channel flows or loss of channel discharge altogether. Dams cause extensive ecosystem changes due to the considerable alteration of natural daily and seasonal discharge patterns, disruption of biological river connectivity (e.g., stopping upstream movement of spawning fish), as well as reduction of natural sediment transport, which would otherwise shape instream habitat. All stream ecosystem processes are related to dis charge. Water movement transports dissolved nutrients and particulate organic matter, and removes waste from the system. It shapes the stream channel creating habitat diversity, brings in new colonists, and allows for the migration of species across the landscape.